The FiveCentsPlease Blog: Put a beagle on your car! California Peanuts fans have waited a long time for this moment, and it finally has arrived; they'll soon be able to travel in the company of the World-Famous Driving Ace. On October 5, Golden State Gov. Jerry Brown signed legislation — carried by Assemblywoman Toni Atkins, D-San Diego — to launch a specialized license plate that features Charlie Brown's favorite companion, Snoopy. You can read additional details here. Information on ordering the plate can be found at snoopyplate.com, linked below. Alas, this wonderful news applies only to California; Peanuts fans in the other 49 states will need to mobilize their efforts! The campaign to add Snoopy to California's roster of special-interest license plates officially kicked off in the spring of 2010, with the debut of the web site snoopyplate.com ... but those of us living close to Santa Rosa's Charles M. Schulz Museum know that plans were afoot quite a bit earlier. We sat (im)patiently as California drivers expressed interest by signing up for the program, and then watched as that number slowly approached the 7,500 threshold demanded by the Department of Motor Vehicles. At that point, the politicians got involved. The California State Assembly passed a bill to established the Snoopy license plate — AB 482 — this past spring, on May 30. The bill then went to the State Senate, which passed it on September 11, sending it to Gov. Brown's desk. Dog-lovers up and down the state felt pretty secure at that point, knowing full well that Jerry Brown often can be seen at the Capitol with his beloved corgi, Sutter. 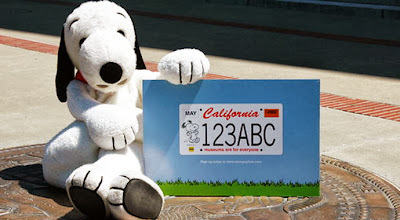 The Snoopy license plate will generate funding to help support California's many diverse museums. The California Cultural and Historical Endowment, a state entity, will administer the California Museum Grant Program with these funds.